I write on this day given to remembering the triumphant entry of Christ into Jerusalem. This year the day seems empty and abstract. The events are too overpowering. The knowledge that Christ’s entry led directly to his Crucifixion looms too (grimly) ahead. This seems the strangest holiday of the year, a celebration of misunderstanding. In this world, the (dominion) has not yet come, though our hearts long for it and our lives incline toward it. These words by John Leax from his essay, “Lent,” (Stories for the Christian Year: The Chrysostom Society, Macmillan, 1992) sum up Palm Sunday in most our churches today. We will begin the liturgy with The Liturgy of the Palms (BCP 270), often outdoors, in which we welcome Christ to Jerusalem and in our midst, celebrating him as King with all “glory, laud and honor.” We rapidly (depending on the weather) process into the sanctuary, waving our palm branches with joy. We are then immediately thrust into themes of humiliation, rejection, and suffering. Following Mark’s gospel this year, we get a more extended reading of Jesus in Gethsemane – his plea for his friends to stay awake with him, and his sense of abandonment when they fall asleep and scurry away into the night in fear. Moving from the Liturgy of the Palms to the Liturgy of the Word, the words of the Prophet Isaiah anticipate the suffering of the Messiah. In this Third Servant Song, the prophet brings comfort to his fellow Israelites who are treating him so despicably. The prophet knows that God has given him a message to speak; but proclaiming God’s Word has brought him the hatred of his hearers, for this was not the word they wanted to hear. That hatred developed into persecution, beating and torture just as it did for Jesus centuries later. Some of the exact terms of Jesus’ suffering are used here. “I gave my back to those who struck me . . . I did not hide my face from insult and spitting” (50:6). Mark’s account of the Passion begins with a foreshadowing of the death of Jesus, as an unnamed woman anoints Jesus with costly ointment. From there we read of the betrayal of Judas; the Last Supper (which Mark presents as the Passover meal); the arrest in Gethsemane; the denial of Peter; and the trial before Pilate in which Jesus offered no defense. And all his followers were now gone. 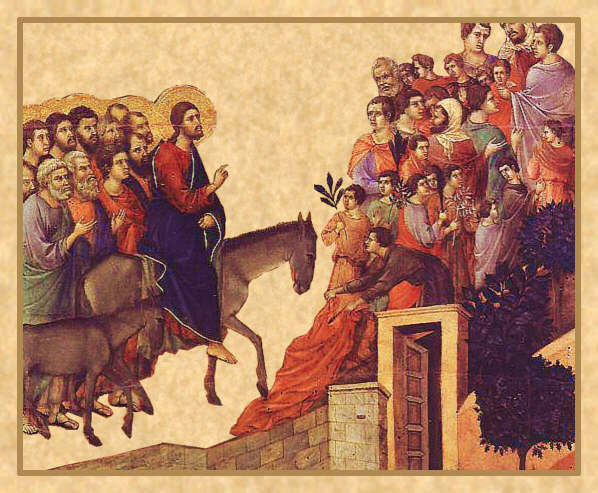 Jesus, when you rode into Jerusalem the people waved palms with shouts of acclamation. Grant that when the shouting dies we may still walk beside you even to the cross . . .
We shall see. Maundy Thursday and Good Friday still remain this week. This week we become a part of this passion week narrative: our fear reflects the disciples’ fear, our denial of Jesus echoes Peter’s denial and our flight from Jesus’ pain traces the steps of the fleeing disciples. We are invited into the dark tapestry of betrayal, denial and abandonment. Through this ominous tapestry runs a thread of love and hope. That thread – the coming of salvation and peace for all believers – weaves today’s people of God into the same tapestry. We become part of this passion week narrative. How will you encourage your congregation to stay with Jesus this week and not simply return to the world with their waving palm branches to return next week with sounds of Easter joy? Read the story of Jesus’ entry into Jerusalem in Mark 11:1-11 and imagine that you are in the crowd lining the street to welcome Jesus. How would you describe the moment when Jesus passes by? What is the mood of the crowd? What are the expectations of the people as Jesus enters the city? What does Jesus communicate about his kingship in these chapters of Mark? What do the events of these chapters indicate about the kind of king the people expect Jesus to be? When have you experienced a great difference between what you expect of Jesus and what Jesus actually wants for your life? By the end of the week, Jesus had been condemned to death as a common criminal. What were some of the forces that combined to bring about his death? How are these same forces manifested in our world today? As you read the account of the trial before Pilate in Mark 15:1-15, how would you characterize the words and actions of both Jesus and Pilate? Why do you think Pilate was “amazed” (v. 5)? The only words spoken by Jesus in Mark’s Passion are found in verse 34. These words are reflected in Psalm 22:1-21. What is the effect of these words for you as Easter draws near? This entry was posted in Education, Feast Days, Lent and tagged Holy Week, Jerusalem, Jesus, Lectionary, Mark, Maundy Thursday, Palm Sunday, Passion. Bookmark the permalink.